President Trump spoke at Trump Tower in New York on Tuesday. 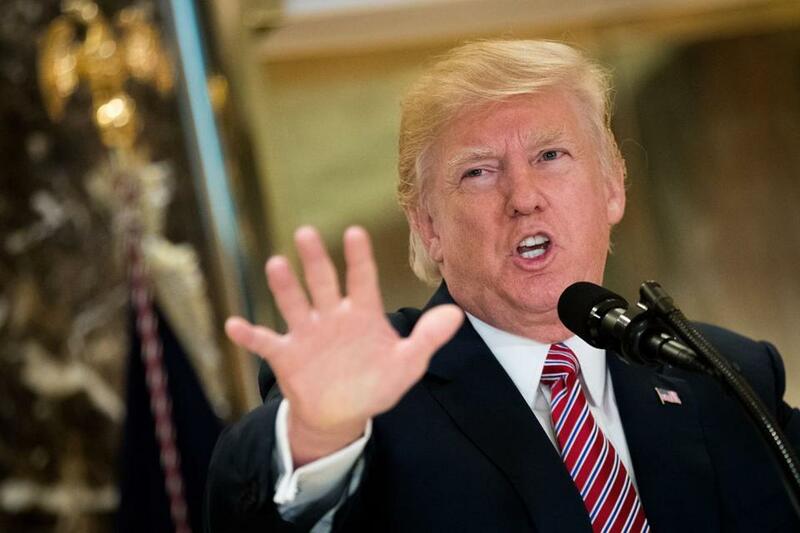 NEW YORK — President Trump reverted Tuesday to blaming both sides for the deadly violence in Charlottesville, Va., and at one point questioned whether the movement to pull down Confederate statues would lead to the desecration of memorials to George Washington. In a combative exchange with reporters at Trump Tower in Manhattan, the president repeatedly rejected bipartisan criticism for waiting several days before naming the right-wing groups and for placing blame on both the right and left for the bloodshed that ended with the death of a young woman after a car crashed into a crowd. “Many of those people were there to protest the taking down of the statue of Robert E. Lee,” Trump said. “This week, it is Robert E. Lee and this week, Stonewall Jackson. Is it George Washington next? You have to ask yourself, where does it stop?” he said, noting that the first American president had owned slaves. The following is a full transcript of remarks made by President Donald Trump at Trump Tower on Tuesday, as provided by the White House. The president’s breathtaking statements inflamed and stunned people across Twitter. “No words,” said Senator Mark Warner, a Virginia Democrat. “Thank you President Trump for your honesty & courage to tell the truth about #Charlottesville,” Duke said in a Twitter post. Again and again, Trump said that the nationalist protesters in the city were not all Nazis or white supremacists, and he said it was unfair to suggest that they were. The president also said that blame for the violence in the city — which also took the lives of two Virginia state troopers when their helicopter crashed — should also be on people from “the left” who came to oppose the nationalist protesters. Fields is being held without bail on charges of murder and malicious wounding in the death of Heather Heyer. The president’s raw and emotional eruption during a news conference about repairing infrastructure was a rejection of the more measured language that Trump offered in a brief statement on Monday. In that statement, Trump appeared to distance himself from his earlier assertions on Saturday that two sides were to blame for the weekend violence. But on Tuesday, Trump returned to his initial feelings about the subject, which poured out without much prompting from reporters at Trump Tower. “There are two sides to a story. I thought what took place was horrible moment for our country, a horrible moment. But there are two sides to the country,” the president said. 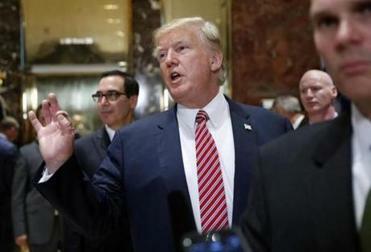 Trump said his initial statement on Saturday was shaped by a lack of information about the events on the ground in Charlottesville, even though television stations had been broadcasting images of the violence throughout the morning. But Trump also made it clear that even now he does not accept the overwhelming criticism that he should have reserved his condemnation for the white supremacist and Nazi groups. Referring to the reporters assembled, he insisted that he had watched the protests “much more closely than you people watched it.” He said that he believes there were “bad” people on both sides, and he criticized others for being unwilling to say that. And he said it should be “up to a local town, community” to say whether the statue of Robert E. Lee should remain in place. 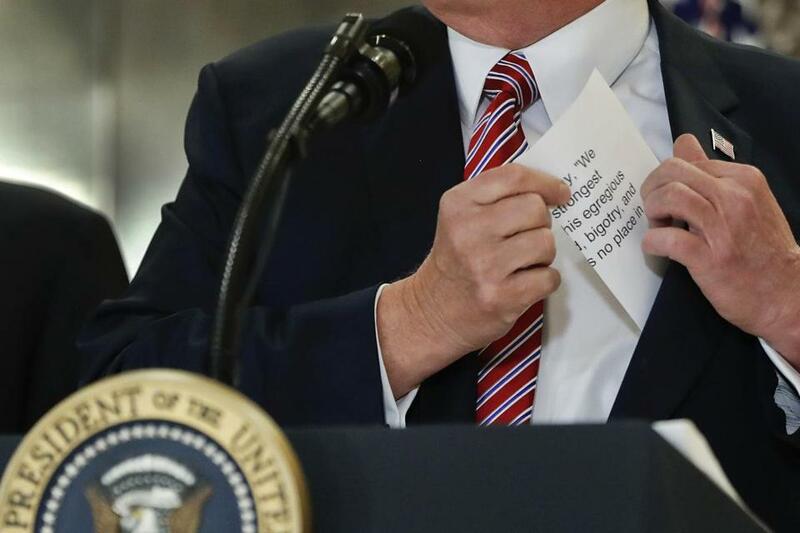 Trump reached into his suit jacket for a piece of paper with the statement he made on Saturday regarding the Charlottesville, Va., violence.